The days of Deadpool playing the hero in the Marvel Universe are over - Deadpool the villain is making his long-awaited return. The minds behind this new chapter in the Merc with a Mouth's life have teased his turn back to villainy and killing for the highest bidder, but now that Marvel's Secret Empire has ended, the tragedy of it all can be appreciated. Wade Wilson turned his time with the X-Men into a full-blown superhero career as one of Captain America's own Avengers, establishing himself as Steve Rogers's right-hand man. Unfortunately for Wade, that meant tying himself inextricably to the greatest villain Earth's heroes ever met. So what do you do when you've been duped into murdering innocent heroes, and painted as a villain instead of the undercover operative you really are? Well, if you're Deadpool, you return to your roots. In other words, become the most hated man in the Marvel Universe - and start dropping bodies like it's your job... again. For Marvel fans who only know Deadpool from his movie debut, where a team-up with the Avengers is just a dream, it may be hard to think of Wade Wilson as anything but a biting, unorthodox, but inherently good mercenary. That's not an alien concept to the comics, either - heck, it's probably why Rogue fell in love with him. But there's no question that Wade has gotten up to some truly dark, corrupted, and murderous deeds lately. Mainly, by following the orders of his infallible idol and killing Phil Coulson for Captain America. It wasn't until after he had murdered the S.H.I.E.L.D. Agent that Deadpool sensed something was amiss with the star-spangled superhero, and by the time his Hydra loyalty was revealed to the world, there was no turning back for 'pool. But there was the chance to turn honest. Reading through Secret Empire, the arrival of S.H.I.E.L.D. 's Maria Hill in Blackout's prison cell came as a total surprise, putting a bullet in his head to free New York City and its heroes (building the momentum towards evil Cap's ultimate defeat). But in Deadpool her inside information was explained. The tip came directly from Deadpool, having gathered information on how to aid the resistance (even keeping their secret base a... secret). Hill took the tip and acted on it, but she also refused Deadpool's real request: to let HIM be the one to help. He had failed Coulson when the evil Steve Rogers rose to power, and Deadpool was reduced to begging Maria Hill for a chance to bring him down. A chance that was denied him, setting an entirely different course of events in motion. You see, it wasn't just that Maria Hill denied Deadpool the chance to tag along and free New York. She buried him beneath the rubble of a parking garage. He was unharmed, thanks to the healing ability making him impossible to kill - but it still took time to dig his way out. Days, in fact - days in which Captain America was defeated by the return of the true Steve Rogers. Days in which the heroes of the world rose up to oppose the Hydra forces and traitors, allied themselves with this new Captain America, and began to rebuild the world they had known. At which point Deadpool rose from the ashes every bit the villain and traitor they believed him to be. It truly is a case of Deadpool fans seeing the hero at his most vulnerable, and most genuine, only to have his efforts, regrets, and guilt twisted against him. 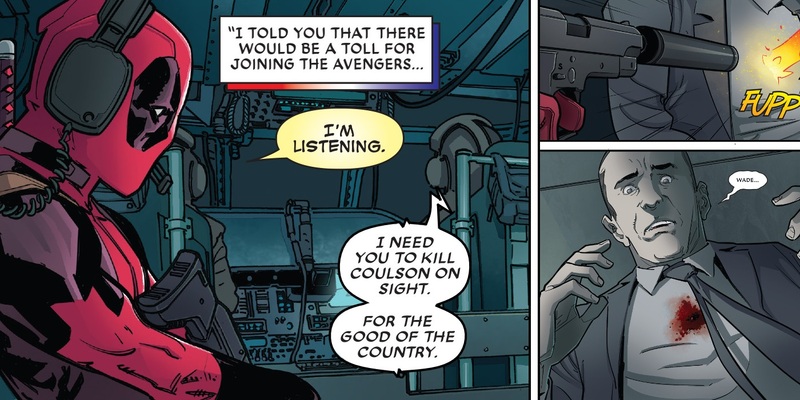 Hill took the credit with little mention of Deadpool's tip, or his claims to be working against Steve Rogers (killing Coulson will buy you that kind of distrust). And when Wade Wilson reduces himself to begging for his redemption in the eyes of the superhero community, only to have sand kicked in his face... well, it's safe to say Marvel's heroes aren't ready for how quickly and decisively Deadpool will return to the line of work he knows best. In fact, that very transformation is how Deadpool will be honoring his comic book roots as part of Marvel's "Legacy" event. Why should the good guys get to have all the fun? Mid-way through the event it's not a secret to readers that Deadpool will get burned in Secret Empire. He will receive the blame for everything he did, and none of the credit for any of the strings he pulled behind the scenes. Peter Parker's luck has nothing on Wilson's. Deadpool's origins were that of a villain. That's what we're honoring in Legacy. So strap in, Deadpool fans, because the list of potential superhero targets Wade has been keeping out of his crosshairs isn't getting any shorter. The Despicable Deadpool #287 will arrive on October 11, 2017. NEXT: Did Fan Outrage Change SECRET EMPIRE's Ending?